Serbia is country number 21 on the tour, if I’ve counted correctly. It’s entirely possible I haven’t counted correctly, as I’m slightly tired after several long days cycling, however I’m still feeling fit and am enjoying the riding. I’m kind of pushing it at the moment to see how quickly I can make it back across Europe to the UK, with a view to possibly trying the Transcontinental Race next year, however I think I’m still a bit off the pace for that. Saying that the bike wouldn’t be as heavy, and the route more direct, for such an endeavour, so who knows. After a very pleasant night at the hotel Transimpex in Lom, I set my sights on Serbia, country number 21 of the tour! Slight calamity first thing; my honey bottle had leaked, causing a bit of a mess in my panniers, however once I’d cleared that up and finished my yoghurt and honey breakfast I set off, saying goodbye to the cycle tourer I met briefly last night, who is going the other way. The road alongside the Danube towards Vidin is a tad on the bumpy side, causing a few occurrences of swearing when I hit bumps or potholes I hadn’t noticed, and you don’t really see the river for a lot of it. I did pass 4 cycle tourers going the other way, two from France and two on a tandem, all heading towards Turkey. There were also a lot of heavy trucks on the road, however once past Vidin I made it to the border without incident. The crossing was very quiet, and I was soon through the Bulgarian checkpoint, saying hello to the bored looking guards and pedalling towards the Serbian side. On the way through ‘no mans land’ I stopped to help push a broken down taxi; it failed to bump-start, however we got it to the other side okay, then I had to walk back to get my bike. The Eurovelo 6 route in Serbia is pretty well sign-posted, and I intend to follow most of it, just cutting out the odd meander where there’s a more direct route and I don’t miss anything interesting. It was only a short ride to get to Negotin, where I stopped or the night at Hostel Olimpik; another very friendly and comfortable hostel, that also provided dinner and breakfast, all for the inclusive price of about £12, bargain! I’d arrived in good time, especially since I’d gained an hour, so after a rest I went for a wander around town in search of ice cream and a few supplies. I need to remember that it’ll get dark earlier now, especially since I’ve gained an hour, so I’ll need to start earlier to avoid having to cycle in the dark. Cycling around the world is quite an attractive prospect, and one that I’ve considered a number of times, however I think I’m going to stick with ‘shorter’ trips for the time being. Edi is going via Iran and then the Stans, which means having to get hold of several Visas, and remembering you can’t withdraw cash using VISA or MasterCard in Iran. He should be able to get an Iranian visa fairly easily, however it’s apparently difficult at the moment if you’re British or American. It was good to relax and chat, and I’m excited about tomorrow when I head to the National Park alongside the Danube and the Iron Gates gorge. The mosquitos decided to attack overnight, which proved very irritating; both Edi and I broke out the repellent however I still got bitten several times. I still slept well, and breakfast set me up well for a long ride; omelette, bread and jam. I bid Edi goodbye and good luck on his ride South, and thanked Olivera the hostel hostess, before I pedalled off towards Kladova and the National Park. I set off at 08.30, however it felt later due to the clocks changing. After few hills I made it to Kladova, where the road swung North again, with Drobeta Turna Severin just across the river on the Romanian side. After a few more kilometres I made it the Iron Gates gorge and National Park. The gorge is the longest in Europe, at well over 100km, and has some Roman history with the Emperor Trajan having constructed a famous bridge over the Danube. The ride through the National Park and gorge was through some of the nicest scenery I’ve experienced in while, and made me realise how monotonous some of the roads have become recently lately. Pedalling through inspiring countryside again did a lot motivate me, and provided a welcome distraction from thinking about the route ahead. The road was also fairly quiet, with little in the way of heavy traffic; just goats, cows, sheep, and frequent circling buzzards. My ride was accompanied by the sound of cawing crows for a while; I was a little suspicious they were following me. I am always impressed by the intelligence of the Corvidae family, and it was interesting to see them dropping nuts on the road to crack their shells. I think they were attempting to get into Walnuts, there being a lot of Walnut trees in this part of the world. It was relaxed riding today, with a lot of singing going on, leaving me in good spirits as I covered nearly 160km, with only about 3 significant climbs. I passed 11 other cycle tourers going the other way, with the usual waves and hellos, but none going my way; I think most people pedal South then either fly or catch a train back. I lost count of the number of tunnels I passed through, maybe 17, however they were all short and as such not suitable lairs for goblins or trolls, so Lobster stood down on guard duty. The tunnels were good fun from an echo point of view, enhancing my fine vocal talents no end. I arrived at the campsite at about 17.00, which was deserted however the shower/toilet block was open, and the power on, so I thought maybe someone would be along later. As it turned out no humans appeared, however I was joined by a cat, and a bit later on by a dog; I think the latter was a stray however he was friendly enough, and slept next to my tent. I seem to be developing a tendency to attract stray dogs. After a shower and some food, the sun quickly set, and I retreated to my tent to read and get an early night. Aside from the meowing cat, and latterly the snuffling dog, the campsite was very tranquil, however I did get woken up at about 23.00 as a few heavy squalls came through. The wind really shook my tent, and the rain was quite hard for a bit; thankfully no leaks! Tomorrow I’ll push join to Belgrade for the night, before heading towards Hungary. I need to check the route and decide how close to the Croatia/Serbia border I go; might take a straighter route to Budapest, if it makes sense and doesn’t miss anything worth seeing. This entry was posted in Bulgaria, Self Propelled 2015, Serbia and tagged Adventure, Bicycle Touring, Bike, Bulgaria, Charity, Countryside, Cycle Touring, Danube, Europe, Expedition, photos, Self Propelled 2015, Serbia on September 25, 2015 by SelfPropelled. Still making good progress, and great to have arrived at the Danube River, which I can effectively cycle alongside all the way to Germany. I’ll follow Eurovelo 6, but with a few detours thrown in for good measure. To be honest I’m not entirely decided on my exact route, but it’ll be fun pedalling North West and seeing what presents itself. Despite a few beverages with fellow hostel guests the previous evening, I felt fine in the morning; must be all the cycling. I was up and had breakfast whilst most people were still sleeping, consuming yet more yoghurt, which has become a bit of a staple. I need to replace burnt calories effectively and healthily, and yoghurt is a good way to do it, or milk, as it also contains protein which helps repair my tired muscles. After packing up and saying goodbye to Fabien, and the Japanese cycle tourer whose name I didn’t catch, I pedalled off towards Sofia, deciding against a rest day in favour of making more progress towards the Danube and home, especially whilst the weather is good. I’m really going to try to think only a few days ahead, even though I’m excited at the prospect of heading back to the UK; thinking about the whole route gets a little overwhelming, despite having covered over 8,000 miles already, and the distance back to Norwich only being about 1,900 miles. On the outskirts of Pazardjik, the first big town after Plovdiv, I bumped into a Bulgarian cyclist on the way back from his allotment. We got chatting as we cycled along, with Boris explaining he had worked in the UK, but was back in Bulgaria for the time being. I also learnt that it’s law to wear a high vis vest whilst cycling outside cities in Bulgaria, but not in cities themselves, which is a bit odd and akin to the helmet law in Spain; I reckon I’m safe as my yellow cycling top is pretty bright anyway. Boris guided me in to Pazardjik, showing me the best way through the city and back on to route 8. He also bought me lunch in the form of some fine meat products from a local cafe (Tiger Cafe); kebab like products which were very tasty when I stopped to eat them a bit later on. Boris insisted I take a couple of huge apples from his allotment to ensure a balanced diet, which proved very tasty, and all organic. Great to meet you Boris and thanks for the route tips and food, very kind of you. The rest the ride to Sofia was quite lengthy, and involved a large climb, which thankfully was pretty gradual; bigger climb coming tomorrow so didn’t want to exhaust legs today. I was helped by the weather, with the sun staying behind clouds for a lot of the time, and even a bit of light rain keeping things fresh. The route passes through some nice forest and small towns, alongside the motorway at times. Route 8 got very bumpy and potholed for one section, as it’s not used by cars much anymore, because they all use the motorway; passed quite a few horse and carts though. Boris had told me earlier that these are mostly the ‘gypsy’ folk, who are nice people but a distinct community; they all tended to give me a wave and say hello, especially the kids. I don’t know if it’s politically correct to label them as gypsies or not. I had a few encounters with dogs today, but nothing too alarming. At one point 3 shepherd dogs spotted me from across a field, and sprinted about 300 metres to the road, barking maniacally. I was a little concerned when they showed no sign of slowing down, and at the speed they covered the distance towards me, however the lead dog proceeded to wipe out on the road verge, tumbling into the long grass, which caused them all to stop. This allowed me to escape un-molested, whilst they attempted to wander off and salvage some dignity; it was all a bit embarrassing for them. After following route 8 for miles it ran out, and I had no option but to join the motorway for the few kilometres to reach the city. This wasn’t really an issue as the hard shoulder is wide, and the few police cars that passed me didn’t object. I pedalled into the busy city, past a lot of monuments and statues, then found Hostel Mostel near Makedonia Square. Several people at Hiker’s Hostel had recently stayed at Hostel Mostel, and recommended it. It’s a lot bigger and busier than some hostels I’ve stayed at, but did a great basic dinner, as well as breakfast, and all for about £8 (including a bed in the dorm) so you can’t really go wrong. It’s a great place to meet people too, or just to chill out after a long day in the saddle as was the case with me. Having arrived a bit later than I usually like to stop, I relaxed for the evening, doing some planning and blog updates; good to catch up! I also did a bit of bike maintenance to fix squeaky pedals, which had begun to annoy me. Smaug seems to be bearing up well, however I’ll need to keep an eye on the tyres still. Tomorrow I head for Lom and the Danube river, assuming I make it that far; there are some big mountains in the way. Going to experiment with a slightly different style on this blog post, and see if it works; writing in a different tense, which might suit converting into a book more – let me know if it works, or not as the case may be. I had a good night’s sleep in the Hostel Mostel dormitory, in Sofia, with about 20 other people in the same room; after a long ride little keeps me awake. The hostel breakfast is excellent, including scrambled and hard-boiled eggs, fruit, bread and jam, all of which makes great cycling fuel. I have a feeling I’m going to need a lot of fuel today, with a long ride to the Danube ahead of me. Avoiding the playful kittens I push my bike out on to the streets of Sofia, under overcast skies. It’s nice not to have to bother with suncream for a change, and to be riding in cooler temperatures. It doesn’t take long to pedal out of the city, and find route 81 heading North. The first part of the ride is fairly boring, through farmland and the occasional village, then the road starts to rise up into the mountains. I climb for several hours, with a few down sections providing a rest for my legs, however I know that means I’ll just need to go back up again, until I reach the top of the pass. My motto for the tour is turning into ‘there’s always another hill’. I pass through a few small towns and villages, where people are selling honey or vegetables by the roadside, leading to a lot of friendly waves or hellos. There are a few bothersome dogs, however in general the canines in Bulgaria don’t seem as aggressive compared with Turkey or Greece; often it seems like they just can’t be bothered. The road continues to meander through fields, before rising up into pine forest, then beech and silver birch. The beech forest is particularly beautiful, especially near the top where wisps of low cloud permeate the canopy. I start to hear music from somewhere as I near the top; it must be from the nearby village, however it was slightly confusing as the sound bounces off hills; quite bizarre in the otherwise peaceful setting. The clouds draw in at the top of the climb, and it gets quite cold, a novel sensation after being so hot for a long time. I stop to catch my breath, next to a cloud smothered reservoir, before starting my descent. There’s a small cafe at the top with a few people sitting outside having drinks; I content myself with a banana and some Haribo. After reaching 1,350m in height, the descent down the other side is going to be exciting. I pass through more beech forest, which proves more beautiful than the Southern side, especially once I emerge from the low cloud. I get the shivers for a few minutes, in the cold and damp conditions, the chill air seeming even colder when you’re travelling at speed. I whizz past a road cyclist going the other way, exchanging waves, then pause for moment to take in the beauty and tranquility of the area. Thankfully the traffic has quieted down, so there is little to interrupt my fast descent, and reduced danger from cars or lorries in the low visibility. I spot a few people filling up water bottles from roadside springs; this seems very common in Bulgaria, with a lot villages having their own springs, which are apparently good to drink from. After really enjoying the mountainous section, even if it was tiring, there follows a long and slightly monotonous ride to Lom and the Danube, across gently rolling farmland, and past the city of Montana. Montana was a possible overnight stop, however I decide to carry on, and am glad I did as it feels very good to reach the Danube, getting rd of some of the anxious and slightly sad feelings I’d been experiencing. As I enter Lom I spot a sign for the Eurovelo 6 route, which brings a smile to my face; this route should take me all the way to Germany! I find the Hotel Transimpex right on the banks of the Danube, and it’s only 30 Leve for the night; about £11.20. This is still a bit more expensive than the last few previous stays, however I have Leve I need to use up, and figure it’s worth it to celebrate reaching the Danube. There’s a nice restaurant attached to the hotel where I have dinner, after a walk around town and a stop at a market to get supplies; important not to run out of Haribo. I briefly meet another cycle tourer who turns up later in the evening, on her way down towards Romania, working on organic farms (WWOOF – look it up, sounds interesting). I expect to meet a few more cycle tourers now I’m on Eurovelo 6, so we’ll see what tomorrow brings as I head to Serbia, country number 21 of the tour. 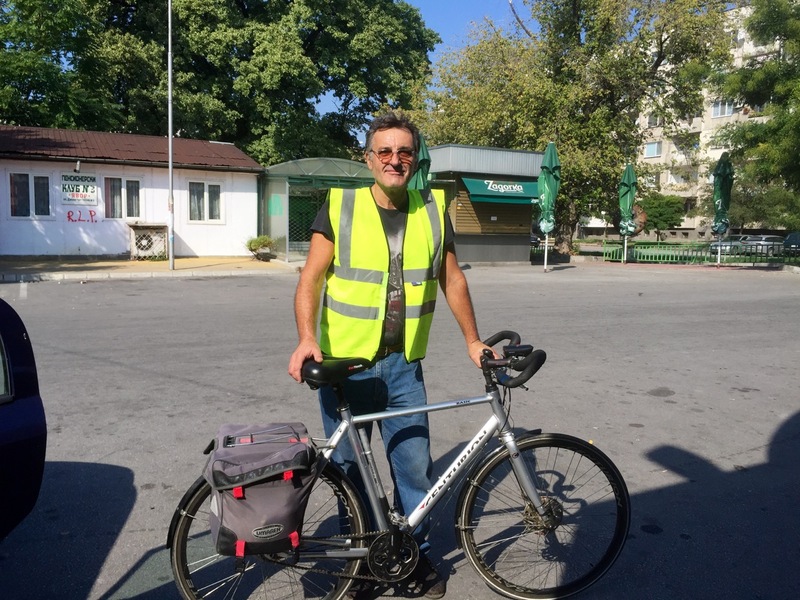 This entry was posted in Bulgaria, Self Propelled 2015 and tagged Adventure, Bicycle Touring, Bike, Bulgaria, Charity, Countryside, Cycle Touring, Danube, Europe, Expedition, Lom, photos, Self Propelled 2015, Sofia on September 23, 2015 by SelfPropelled. I forgot to mention the ‘lovely-jubbly’ man in my last blog post! He was stationed near the Basilica Restaurant chatting to tourists and inviting them to his shop. He must have watched a lot of Only Fools and Horses because he repeated the classic Del Bog phrase constantly; hearing ‘lovely-jubbly’ shouted down the busy Istanbul streets was a somewhat surreal experience. It’s been 3 focused cycling days since Istanbul, as my mind turns towards getting home, however I need to remember to slow down a bit and enjoy the ride. I’m a bit nervous about the route, what with border closures and migrant/refugee issues being in the news a lot, however as yet I’ve not run into any difficulties, and think I’ll stick with my planned route up to the Danube, then following it to Germany. I felt quite emotional leaving Istanbul and finally pointing my bike in the direction of home, after four and a half months on the road. I’ve still got a long way to go though, and need to concentrate on the next few days rather than what I’m doing when I get to the English Channel, otherwise it all gets a bit overwhelming. 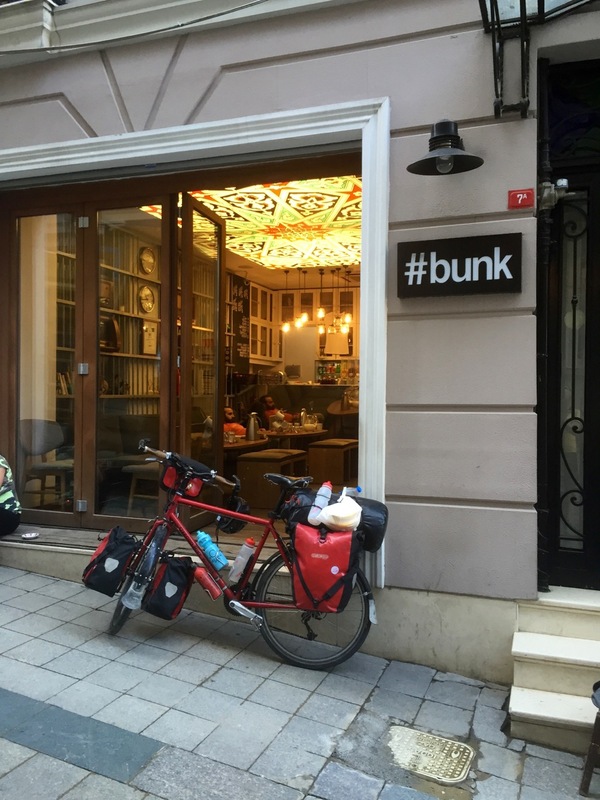 After charging my energy reserves over a hostel breakfast, I packed up and bid goodbye to the #bunk hostel. I decided to pedal back along the coast to Silivri, then take the D100 North, rather than go via Saray; the latter a longer route, and more rural so increased chances of being molested by dogs. The road out of Istanbul was just as busy as when I pedalled into the city a couple of days ago, although I did take a slightly more road-about route. I remained on high alert until I was well past the 3 lane chaos, with slip roads, buses, taxis and random driving all adding to the ‘fun’. The road has a lot of debris on it, which I think caused the puncture I noticed later on in the day; quite a slow one where a shard of glass had pierced my rear tyre. If I was using Schwalbe Marathon Plus tyres I doubt they’d have punctured, and I’ll keep an eye out for a shop selling them in a suitable size. Changing tyres will probably have to wait until Vienna; my current tyres should last until then anyway – they’d probably get me all the way home..maybe…best play it safe. One of two ice-cream breaks; hot day! After about 80km I started to head away from the coast, and reached the town of Corlu, a possible destination for the night, however it was still early and I wasn’t feeling very tired to I decided to press on to Luleburgaz. The road continued to rise and fall over ongoing hills, meaning I ended up climbing a total of 1,466m today, over the case of 161km; I was helped by a bit of a tailwind, and a few ice-cream breaks. Whilst I felt strong physically, my mind was a little fragile due to thinking about getting back to the UK too much, as well as being anxious about the route and possible border closures. When I pedalled around the UK coast in 2013 I rarely had any sad days, however they’re a bit more common on this tour, as it’s been mentally harder, a well as longer; need to live in the moment more rather than looking ahead too much. Despite a punctured rear tyre, which I had to stop and pump up a couple of times, I eventually made it to Luleburgaz and found a cheap hotel of the evening. Hotel Arda is a bargain at approximately £6 a night, although they could really do with cleaning the rooms occasionally; didn’t really bother me as only need somewhere to sleep, and the shower worked alright. The owner proudly informed me I was the 10th cycle tourer to stay at the hotel this year, and as such qualified for free tea and coffee; shame I don’t drink caffeine. The hotel has hosted French, Canadian, German, British and American tourers, which isn’t that surprising seeing as it’s on the route to Istanbul and there isn’t a lot of choice if you need to stop in this area. Despite only speaking rudimentary English we managed quite a long conversation, and I was again struck by how friendly most people are in Turkey. After mending my puncture, and phoning home which helped boost morale, I headed into town to find some food; very nice kebab, as well as a quick visit to a supermarket for a few supplies. I’m eating a lot of yoghurt at the moment, as it’ supplies a lot of energy and is reasonably healthy; also got some nice honey to add to it. This should be my last night in Turkey, as I head over the border into Bulgaria tomorrow, as long as it’s not closed or blocked with refugees/migrants. Another day of not many photos as I remain focused on cycling; the scenery wasn’t particularly noteworthy in any case. I did pass a few cycle tourers going the other way, who all waved or shouted hello, but didn’t pass or get passed by any going my way; think a lot of people fly back once they’re reached Istanbul, if they’re not carrying on round the world. Rather basic hotel room, but fine for my requirements, and choice of 3 beds! I woke up at about 06.00 to the sound of early morning prayers at the local mosque, which were pretty loud, and left me slightly confused as to where I was for a few moments. I’d slept very well until then, despite the slightly grotty room and several mosquitoes buzzing about and biting me. The good news was my rear tyre was still inflated after I’d mended the puncture last night, which was a relief. If the fix hadn’t worked it would have most likely been flat by the morning, so one less thing to worry about. I set off on the road to the border with Bulgaria, the D100 again, passing through Edirne after about 50km, where there’d apparently been some migrant trouble. I didn’t see any trouble, or anyone that looked like migrants/refugees for that matter, however I think they’d all been moved to the border with Greece, or were on the motorway rather than the D100. There were an awful lot of empty plastic bottles next to the roadside, which suggested a large volume of people had walked that way, however empty plastic bottles next to the road are hardly an uncommon sight; people just throw them out of their car windows, which I find a very strange attitude. I started to pass a long queue of lorries next to road-side, with a about 7km still to go to the border. I wondered if something was up, however the cars were still whizzing along. I stopped for a cold drink at a garage, and the attendant informed me it’s always like that; large number of lorries and smallish border. It took me about 25 minutes to get through the border checks and into Bulgaria; I got a passport stamp for leaving Turkey, but not one for entering Bulgaria unfortunately, I guess because it’s an EU country. I did get sprayed with water/disinfectant as I pedalled through, which was a bit of a surprise, however the bike, and no doubt me, could do with a wash; I guess it’s a precaution to help prevent the spread of diseases such as foot and mouth. After the border I joined route 8, a much quieter road and far more enjoyable, with more trees and more sympathetic countryside. At a truck stop I found an Exchange shop where I changed my remaining Turkish Lira into Bulgarian Leve, at a reasonable rate. It’s good to get rid of leftovers, as you tend to end up with a wallet full of currencies you can’t use anymore. Route 8 went a bit off-road at one point, and through a waste dump (most traffic is on the motorway), however I stuck with it and it was a nice ride to Lyubimets. After an 80 mile ride I checked into Hotel Fantasy, stopping slightly earlier than has been normal. There are very few campsites in Bulgaria, that I can find anyway, so I’m likely to be staying in hostels or hotels for the duration, all of which seem to be cheaper than many of the campsites I’ve stayed at on Western Europe anyway! I might wild camp if I find a suitable spot, however as hotels/hostels are so cheap it’s just as easy to use them. After washing my cycling gear, which was getting a little odorous, and a quick wander around town, I had a meal in the hotel restaurant, which was also very cheap, and a cold Bulgarian beer which was very pleasant. Dinner at hotel fantasy; salad and snitzel, excellent! I’m feeling a lot less anxious and relaxed now I’ve crossed into Bulgaria with no issues, and am making good progress. Whilst the language is hard, Bulgarian people are really friendly again; long may this trend continue. Aiming for the ancient city of Plovdiv tomorrow. Another reasonably long day in the saddle today, covering 131km to Plovdiv, and to another hostel for the night. Staying in hostels is great, as you generally get to meet lots of like-minded individuals, and even other cycle tourers. The Hiker’s Hostel in Plovdiv is a good example, and nice because it’s not massive, and has a courtyard where you can relax and chat to people; the beer is also cheap and cold. Plovdiv itself is a fascinating old city, with loads to see. It’s origins can be traced back thousands of years, and from what I read it’s been invaded many times, by all sorts of people, who have all left their mark in the archaeology, much of which can still be seen. I didn’t do a lot of sight-seeing, as it was just nice to chill-out and chat for an evening; loads of different nationalities at the hotel including British, French, Australian, German, Czech, Austrian and Bulgarian. The host, Todo, was another friendly Bulgarian, who appeared a bit later on in the evening with some Rakia, a strong Bulgarian spirit, brewed by the locals, which left everyone smiling; there are variants of this all over the Balkans and down into Turkey. To get to Plovdiv was a simple case of following route 8 again, from Lyubimets up through the countryside heading North West. I pedalled for about 7 hours, through more farmland, and small towns with roadside stalls selling produce; lots of squashes, and jam. The road got busier latterly, and I spotted a few German cars heading North, probably returning home from holidays; strong to think they’ll make it to Germany in hours rather than days (admittedly a lot of hours). As with yesterday there were a couple of cycle tourers heading South who I waved to. After a cold drink/snack break at a garage I arrived on Plovdiv, pedalled about a bit trying to find the hostel, eventually went the right way, and checked in. This post has gone a bit back-to-front, however needless to say I spent a very relaxed evening chatting to other guests. Conor, originally from Cumbria, is in the process of hitching back to the UK from Australia, no mean feat and some interesting stories, whilst Fabien is on his way back to Normandy from Greece. There was also a Japanese cycle tourer, who started in Estonia several weeks ago and is pedalling around Europe a bit, a German guy who makes his own music and is touring in his minibus, and Ming from Singapore. All interesting folks, and apologies for forgetting or misspelling any names! There were a few feisty political discussions, mostly revolving around the migrant situation, however it was all good debate and interesting that everyone mostly thinks the same thing. I even managed to get a bit of planning done in between chatting. The Rakia definitely helped ease aching muscles; developing a slight twinge in my back that I’ll have to keep an eye on. Tomorrow I intend to head to Sofia, a long ride with a significant climb which will put me well on the way to the Danube; or I might have a rest day. One last thing – heard about the Rila Monastery in Bulgaria, which sounds like a great place to visit; famous Eastern Orthodox monastery where you can stay. It’ll have to go on the list for a return visit, as is a bit off route, and majorly into the mountains! This entry was posted in Bulgaria, Self Propelled 2015, Turkey and tagged Adventure, Bicycle Touring, Bike, Bulgaria, Charity, Countryside, Cycle Touring, Europe, Expedition, photos, Plovdiv, Self Propelled 2015, Turkey on September 21, 2015 by SelfPropelled.